Detroit is a huge city with several district articles containing sightseeing, restaurant, nightlife and accommodation listings — have a look at each of them. Detroit is the largest city in the US state of Michigan, known for its Motown sound, rock music, world class museums, automobile culture, sports teams, arts, and theatres. After decades of decline and population loss, Detroit has seen many of its historic buildings renovated, and its downtown core bustling with new developments and attractions. Detroit offers many things to see and do, an exciting travel destination filled with technological advance and historic charm. Detroit's central business district, contains most of the prominent skyscrapers in Detroit, the nation's second largest theatre district, several parks, three casinos, and three major league sporting venues. Detroit's cultural center, home to several world class museums, art galleries, and Wayne State University. Detroit's eastside, a collection of former blue collar neighborhoods that have suffered from extensive urban decay, has many hidden gems worth checking out in a car, including Belle Isle and The Heidelberg Project. Detroit's southwestside, an industrial region home to trendy and ethnically diverse Corktown and Mexicantown neighborhoods. Detroit's westside, a large residential area that has a mix of numerous historic neighborhoods with mansions and blue collar neighborhoods built in the early 20th century. While never annexed with the city of Detroit, the cities of Hamtramck and Highland Park are entirely landlocked by Detroit and function as neighborhoods of the city. Hamtramck has a large Polish population and is known for its numerous bars and restaurants. Downtown Detroit is unique: an International Riverfront , ornate buildings, sculptures, fountains, the nation's second largest theater district, and one of the nation's largest collection of pre-depression era skyscrapers. Two major traffic circles along Woodward Avenue surround Campus Martius Park and Grand Circus Park, both gathering points. The city has ample parking much of it in garages. Many historic buildings have been converted into loft apartments, and over sixty new businesses have opened in the Central Business District over the past two years. Downtown Detroit features the Renaissance Center, including the tallest hotel in the Western Hemisphere, the Detroit Marriott, with the largest rooftop restaurant, Coach Insignia. Many restaurants emanate from the Renaissance Center, Greektown, the arts and theatre district, and stadium area. Joining the eastern, riverfront parks, the city has the 982-acre (3.9 km²; 2.42 sq mi) Belle Isle Park with the large James Scott Memorial Fountain, historic conservatory, gardens, and spectacular views of the city skyline. Visitors may reserve a public dock downtown at the Tri-Centennial State Park and Harbor. Great Lakes Cruises are also available. Surrounding neighborhoods such as Corktown, home to Detroit's early Irish population, New Center , Midtown, and Eastern Market  (the nation's largest open air market), are experiencing a revival. Detroit has a rich architectural heritage, such as the recently restored historic Westin Book-Cadillac Hotel, the Guardian and Fisher buildings with exquisitely ornate interiors and exteriors, the Detroit Institute of Arts (top five museums in the country) to name a few. In 2005, Detroit's architecture was heralded as some of America's finest; many of the city's architecturally significant buildings are listed by the National Trust for Historic Preservation as among America's most endangered landmarks. Detroit is the largest city in the U.S. to offer casino resorts. The three major casino resorts are MGM Grand Detroit, Greektown, and MotorCity. With Caesar's just across the river in Windsor, Ontario, Canada. Detroit Metro Airport is one of the few to offer world class hotel and meeting facilities inside the terminal. The Renaissance Center and the Southfield Town Center are among the nation's finest mixed use facilities for large conferences. Downtown Detroit serves as the cultural and entertainment hub of the metropolitan region, Windsor, Ontario, and even for Toledo, Ohio residents, many of whom work in metropolitan Detroit. While most of the region's attractions are in the city of Detroit, tourists will find that nearly all of the shopping malls are located in suburbs, such as Troy. The Detroit-Windsor metro area population totals about 5.9 million; it jumps to 6.5 million if Toledo is included. An estimated 46 million people live within a 300 mi (480 km) radius of Detroit. The city's northern inner ring suburbs like Ferndale, Southfield, Royal Oak, and Birmingham provide an urban experience in the suburbs complete with dining, shopping and other attractions. The Detroit area has many regal mansions, within the city and especially in Grosse Pointe, Bloomfield Hills, and Birmingham. Ann Arbor provides the nearby experience of a college town. Detroit is an international destination for sporting events of all types; patrons enjoy their experience in world class venues. The Detroit Convention and Visitors bureau maintains the Detroit Metro Sports Commission . The city and region have state of the art facilities for major conferences and conventions. Detroit is known as the world's "Automobile Capital" and "Motown" (for "Motor Town"), the city where Henry Ford pioneered the automotive assembly line, with the world's first mass produced car, the Model T. During World War II, President Franklin Roosevelt called Detroit the "Arsenal of Democracy." Today, the region serves as the global center for the automotive world. 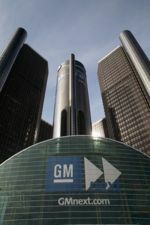 Headquartered in metro Detroit, General Motors, Ford, and Chrysler all have major corporate, manufacturing, engineering, design, and research facilities in the area. Hyundai, Toyota, Nissan, among others, have a presence in the region. The University of Michigan in Ann Arbor is a global leader in research and development. Metro Detroit has made Michigan's economy a leader in information technology, life sciences, and advanced manufacturing. Michigan ranks fourth nationally in high tech employment with 568,000 high tech workers, including 70,000 in the automotive industry. Michigan typically ranks among the top three states for overall research and development investment expenditures in the US. Detroit's climate is continental, therefore subject to rapid change and a variety of weather. Winters are snowy and very cold, with an even colder wind-chill factor. Snow usually doesn't remain the entire winter. Spring and fall are normally pleasant but colder temperatures will likely creep in during late fall and remain during early spring. Summer is rather short, but often times it is hot and muggy with sometimes strong to occasionally severe thunderstorms. Detroit is bordered to the south by the Detroit River, which divides the US and Canada. Detroit is the only place in the continental US where you have to go south to enter Canada. Downtown is adjacent to the riverfront, so the rest of the city expands north, east, and west from downtown. For major roads, the Detroit area is laid out in wheel-and-spoke configuration downtown, strip-farm configuration along the river front, and grid pattern elsewhere. Woodward Avenue runs northwest-southeast (more or less) and divides the northern half of Detroit into east and west; West Warren Street, for instance, becomes East Warren Street when it crosses Woodward. The wheel-and-spoke configuration was designed in the 18th century for tactical reasons when Detroit was a fort. Mile roads run east-west, start north of downtown Detroit and continuing through Macomb and Oakland counties. These mile roads may not have their traditional street name in some suburban areas. Detroit Metro Airport (IATA: DTW)  is in Romulus, about 20 minutes west of the city proper, located at the junction between I-275 and I-94 with many nearby hotels. The airport is a major Delta hub and operational headquarters, so it offers direct flights to and from a surprising variety of cities, from Seattle to Amsterdam, Paris, Seoul, Shanghai, and Sao Paulo. The terminal offers Delta SkyClubs as well as a Westin Hotel and conference center. The midfield McNamara Terminal serves Delta and its SkyTeam partners; all other carriers utilize the new North Terminal. For convenience, the McNamara Terminal and North Terminals have both domestic and international gates in the same terminal. An enclosed tram system shuttles travelers in the McNamara Terminal. There is a free shuttle between the terminals: look for blue and white vans that say "Westin - Terminal." The airport is one of the most recently modernized in the US, with six major runways. The quickest way to get to downtown Detroit is to rent a car, take an uber, or taxi. Standard cab fare to downtown is $45-$50. Standard Uber fare is $31-40. For McNamara terminal, go to ground transportation and walk across the metrocab area. You can also get to Detroit using the SMART (suburban) mass transit bus system . Route 125 serves the airport approximately every half hour, beginning alternately at the Smith and McNamara terminals (no bus serves both terminals), and takes about 75 min to get downtown. The fare is $2.00. Familiarize yourself with the route map and schedule before you try this–-it is more commonly used by workers at the airport than tourists. Airport Shuttle and Taxi services are available by reservation. Reservations 9a-9p (313) 759-7741. Rates from Detroit Metropolitan Airport to downtown Detroit are $49.00 + $10.00 Airport Fee. Detroit Metropolitan Airport charges a $10.00 fee to all licensed transportation providers this fee to pick up passengers at the airport. Several interstates converge in downtown Detroit. I-75/the Chrysler (north of Downtown)/the Fisher (south of Downtown) Freeway North/South runs from Toledo through downtown Detroit to the Upper Peninsula of Michigan. I-94/the Ford Freeway East/West runs from Chicago to Detroit and continues up to Sarnia. I-96 East/West heads from Detroit to Lansing, Michigan. I-696/the Reuther Freeway runs along about 3 mi north of city limit (8 Mile), connecting the eastern suburbs (such as St. Clair Shores) to Southfield. I-275 connects with the suburb of Livonia. 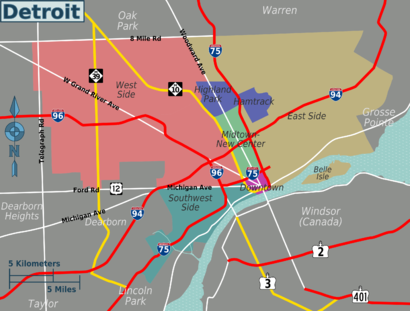 Highways, the Lodge Freeway, M-14, M-23, and the Southfield Freeway are major freeways which interconnect with the Interstates in the Detroit metro area to ease navigation. The Southfield Freeway connects Dearborn to Southfield. The Lodge Freeway, connects Southfield to downtown. Highway M-14 connects Ann Arbor to Detroit via the Jeffries Expressway. Bypassing Ann Arbor, highway M-23 connects I-94 to I-96. The metro area's major Interstates and freeways were overhauled in preparation the 2006 National Football League Super Bowl XL in Detroit and are in good condition. As with any major city, traffic during rush hour can make travel really slow. This is especially aggravated during shift changes at the local automotive plants. But due to economic hardships for the region, rush hour traffic lasts less than an hour, and some freeways are clear all day. The Mixing Bowl, I-75/696 interchange, the I-94/Ford Freeway through Detroit, and the Southfield Freeway can be slow in late afternoons. However some freeways can be congested. Westbound I-696: Dequindre Curve to Woodward; Coolidge Highway out the Mixing Bowl; Drake Rd. to I-96. Eastbound I-94: Warren Ave. to Mt. Elliott St.
For smaller streets, the Detroit area is laid out in wheel-and-spoke, grid, and strip-farm configuration. This was due to first French development (strip farms along the river), early city layout (wheel and spoke from the river's edge), followed by the modern North/South grid. Mile roads run east-west, starting at downtown Detroit and increasing as you travel north. These mile roads may change name in different cities, so pay attention. There are also several spoke roads, including Woodward Ave, Michigan Ave, Gratiot Ave, and Grand River Ave. Only in the old downtown business district is the original Washington D.C./L'Enfant-style wheel and spoke layout found (it is quite confusing, with several one-way streets added for fun). In areas along the River and Lake St. Clair, the colonial-era French practice of allocating strips of land with water access is seen as main roads parallel the water, and secondary roads perpendicular to it. This is very confusing to non-residents. Greyhound . Service west to Chicago (5-8 h, $35), east to Toronto (5-6 h), and south to Toledo (1 h, $15), as well as all over Michigan. The terminal is near downtown at 1001 Howard St.
Megabus . 1-877-462-6342 Express bus service to/from Chicago, Ann Arbor and Toledo. Double Deck Coaches with WiFi, Restrooms, Power Outlets and seats starting at $1. Bus stops are located at Cass and Warren, near Wayne State University and the museum/cultural district, or at the Rosa Parks Transit Center at Cass and Michigan. Transit Windsor . Running seven days a week for $4.50. Service from 300 Chatham St West in Windsor into, and around downtown Detroit. Amtrak, 11 W Baltimore Ave (at Woodward), . Train service to and from Chicago on the Wolverine Service (5-6 hours, $25-$50), with many connections in Chicago. Deeply discounted tickets are often available at Amtrak's weekly specials page . For travel to the east, a bus is available to the Toledo Amtrak station, with connecting trains to New York (21 hours, $75-$150) and Washington, D.C. (16 hours, $65-$130), but travelers may find the middle-of-the-night departures unappealing. The train station is located in the New Center neighborhood. U.S. and Canadian citizens are required to present a passport, passport card, enhanced driver's license, or trusted traveler card when crossing the US-Canada border. For more detailed identification requirements, visit Western Hemisphere Travel Initiative (WHTI). Although it is efficient for an international border, this is the busiest crossing between the two countries, with frequent delays. Pedestrians cannot walk across the bridge or through the tunnel, they must use the tunnel bus. Bicyclists are also prohibited from using the bridge and the tunnel and may use the bike racks. The only way someone traveling by bike can bring their bike across the border is to disassemble the bike and put it in a bike bag, which can be brought on the bus. Detroit spreads over a large area, it is difficult to be without a car. An extensive freeway system and ample parking make the region one of the most auto-friendly in North America. Detroit has one of America's most modern freeway systems. See the Michigan Department of Transportation  website for a current listing of downtown road closures and construction projects. Downtown has parking garages in strategic locations. Greektown Casino, located downtown, has a free 13 floor parking garage. Visitors are welcome to pay to park at the Renaissance Center garage. There are plenty of pay-to-park garages, lots, and valet near the Greektown/stadium areas. Premium parking right next to the stadium is well worth the extra price and usually available during a game. Downtown has an ease of entry from the freeways that may surprise new visitors. Valet parking is available at four Renaissance Center locations, the main Winter Garden entrance along the Riverfront, the Jefferson Avenue lobby, Marriott hotel entrance west, and Seldom Blues entrance west. Detroit has an abundance of taxi, limo, and shuttle services. Car rental prices are reasonable. While MDOT has since discontinued emphasis on the names of freeways, most locals still cling to their names. Make sure you have an atlas with the names as many road s change names as you go along them. Fisher/Chrysler Curve: Near downtown Detroit, I-75 makes one of the sharpest turns in the interstate system. It is also the change between the Fisher Freeway and Chrysler Freeway. So if you are going north on the curve it is the Chrysler Curve, if south, the Fisher Curve. Unlike in most other US cities, traffic signals change to yellow while the pedestrian signal ("hand") is still flashing. Exercise caution at intersections to avoid hitting pedestrians scrambling to cross the street when the signal is yellow. A car is helpful for getting around the rest of the city, but due to the unusual layout and large number of one-way streets, getting out and walking for a few blocks is a good way to see downtown. Bike rentals are available in downtown Detroit along the International Riverfront at Rivard Plaza from Wheelhouse Detroit. There is also a public bike share available in Downtown and Midtown called MoGo. If you go the kiosk, you pay $8 to use the bike for 24 hours. You are given a 5 digit code that can unlock a bike. However each ride can only be 30 minutes, and you get charged an extra $4 if you exceed the 30 minute window. To save money, you can buy a monthly pass online for $18 (this option is not available at the kiosk). Like bike shares in other cities, day, week, and annual passes can be bought which allow unlimited 30-minute rides between stations. Download the cyclefinder app to find the locations of where you can pick-up and drop off the bicycle. Also, bicycles are allowed on the new Q-line (just be sure to store it vertically). Detroit is one of the best cities for biking, with a thriving bike culture. Streets are flat and have usually multiple lanes in each direction. Motorists are used to bikes on the road and are usually courteous. The city has made an effort to increase the number of bike lanes, though you will find an occasional parked car. Detroit is home to many budding bike co-ops, the most active is The Hub of Detroit, and its sister program Back-Alley Bikes. Back-Alley Bikes has weekly volunteer nights, and monthly women and transgender bike workshops. There are two major regular group rides visitors should check out. Slow Roll is a big community ride every Monday from roughly May to September. Check the website for each week's starting point. Detroit Critical Mass is held on the last Friday of every month. Check the location and time before you meet-up. Attendance varies with season. Always exercise caution while biking, as aggressive driving and speeding can be common. The Detroit Department of Transportation  provides mass transit bus service within the city of Detroit. Downtown has a the new Rosa Parks Transit Center. DDOT buses are yellow and green. For safety, DDOT buses may be patrolled by the Wayne County sheriff's deputies. 17 routes serve the central bus terminal, which is downtown at Cass Street and Michigan Avenue. The standard fare $1.50; transfers are $0.25. In addition, people traveling throughout Detroit and the suburbs may use the SMART bus system, which services most areas in metro Detroit. . Standard fare is $2.00 and a transfer is $0.25. SMART only operates within the city limits Monday-Friday during morning and evening commute times. Detroit does not have a elevated/subway network that covers the entire city. In 1987, the People Mover  was completed, an automated, elevated rail system that runs a three mile loop in the downtown area. It is the best way to get around the downtown area. A round trip excursion, covering 13 stations, takes approximately 20 min, and offers great views of the city's downtown landmarks. Signature stops include the Renaissance Center (GM HQ & Retail Complex), Greektown, Joe Louis Arena (Home of the Detroit Red Wings), Cobo (Convention) Center, and Cadillac Center (Campus Martius Park). The stations feature original works by local artists. Standard fare $0.75 in cash, and a token can also be bought at the same price. The people mover only travels in one direction (think of it more as a monorail). This is only a small list of some of the biggest attractions and even though they are listed here, their info is brief. Make sure to check out the district articles for more. Renaissance Center, also known as the Ren Cen, is a group of seven interconnected skyscrapers whose central tower is the tallest building in Michigan and the tallest hotel in the Western Hemisphere. Built in 1977, it has the world's largest rooftop restaurant that can be reached by a glass elevator ride. The headquarters of General Motors, it is on the Detroit International Riverfront. See: Downtown. Fisher Building is a historic Art-Deco building designed by Albert Kahn in 1928. It has been called Detroit's largest art object. See: Midtown-New Center. Guardian Building is a bold example of Art Deco architecture, including art moderne designs. The interior, decorated with mosaic and Pewabic and Rookwood tile, is a must-see. See: Downtown. Westin Book Cadillac Hotel is a recently renovated architectural gem first built in 1928. See: Downtown. Wayne County Building is America's best surviving example of Roman Baroque architecture. See: Downtown. Corktown is Detroit's oldest neighborhood. It was settled by Irish people from County Cork, hence the name Corktown. Many historic landmarks are located in the neighborhood, such as the abandoned Michigan Central Station and Tigers Stadium. Greektown is Detroit's most famous neighborhood, known for its nightlife and gambling scene. It has an endless number of Greek restaurants and is home to Greektown Casino. Mexicantown is the fastest growing neighborhood in Detroit. Predominantly hispanic, the area is famous for its Mexican cuisine, which is evidenced by its vast number of restaurants. Palmer Woods is a private historic neighborhood in the city of Detroit west of Woodward Avenue and north of Palmer Park. Woodbridge is a historic district largely untouched by decline which has many architecturally significant houses, most of which are Victorian-style. Charles H. Wright Museum of African American History holds the world's largest permanent exhibit on African American culture. See: Midtown-New Center. Detroit Institute of Arts is one of the most significant museums in the United States. It has an art collection worth more than one billion dollars. See: Midtown-New Center. Hitsville U.S.A. was Motown Records' first headquarters. Berry Gordy founded it in 1959, and all of the Motown hits were recorded here. Today, the building houses a museum of the history of Motown Records. See: Midtown-New Center. Campus Martius Park is Detroit's main park. Several skyscrapers surround this park and the adjacent Cadillac Square Park, which was made in 2007 to increase the amount of park space. The park is also home to several monuments, such as the Michigan Soldiers' and Sailors' monument, a Civil War monument. See: Downtown. Hart Plaza is a park located on Detroit's riverfront. It offers great views of the city's skyline and also has several monuments, such as Dodge Fountain and the Joe Louis Fist. See: Downtown. Grand Circus Park is a park that connects the financial district to the theatre district. It is also surrounded by many skyscrapers. The park also has many monuments and statues. See: Downtown. This is only a small list of some of the some key activities and events to enjoy and even though they are listed here, their info is brief. Make sure to check out the district articles for more. Casinos The three major casinos include, MGM Grand Detroit, Motor City and Greektown. Check for performances. Concerts, and more Detroit is the birthplace of American electro/techno music, with Juan Atkins, Kevin Saunderson, and Derrick May all hailing from the area. Although other cities around the world have picked up Detroit's torch and carried it further in some ways, Detroit is still a great place to dance and see the masters at work. Cruise Ships, the Great Lakes Cruising Coalition  The Dock of Detroit  receives major cruise lines on the Great Lakes. Adjacent to the Renaissance Center on Hart Plaza. Local tours include Diamond Jack's River Tours . Chartered tours are also available. Detroit's Night Life includes a multitude of clubs throughout the metropolitan area. Detroit's Vibrant, Underground Arts Scene Detroit is home to over 80 galleries, with artists hailing from around the world. Artists are attracted to Detroit due to its abundance of raw, under-utilized industrial space and its inspiring environment of pre-depression era buildings. Detroit's Music Scene The Detroit sound is the sound of the world. It is shaped by Detroit's unique past, its cultural diversity, its energy and its future. Detroit's public information campaign, "The World is Coming, Get in the Game" features an online tour of this music scene. Keep in mind that unlike some cities, there is no central entertainment district (Greektown only partially counts) and many up and coming groups play at venues scattered throughout the area. International Freedom Festival  Begins the last week of June. Motown Winter Blast  Held in January or February in Campus Martius Park, includes ice skating, concerts, and a street party in Greektown. North America International Auto Show  Cobo Hall, Detroit. NAIAS is held in January. Spirit of Detroit Thunderfest  Hydoplane races on the Detroit River. Mid-July. Theater See a performance, Detroit's theaters include the Fox Theater, Fisher Theater, Masonic Theater, Gem Theater & Century Club, Detroit Opera House, and Orchestral Hall. Located in Ann Arbor, about 45 miles west of Detroit, the University of Michigan ranks as one of America's best. Alumni include President Gerald Ford and Google co-founder Larry Page. Others include Wayne State University (alumni include legendary White House Correspondent Helen Thomas and comedian/actress Lily Tomlin), University of Detroit-Mercy, Lawrence Technological University, Oakland University, Oakland Community College which is one of the largest Community Colleges in Michigan, Eastern Michigan University, Marygrove College, and College for Creative Studies. The Detroit area has many civic and professional organizations. The world headquarters for the Society for Automotive Engineers (SAE) is in Troy, MI and the Center for Automotive Research (CAR) is headquartered in Ann Arbor, MI. Others include the Detroit Economic Club, the Detroit Athletic Club, the Greening of Detroit to promote urban forestry (tree planting), the Detroit Riverfront Conservancy, Detroit Renaissance, and Detroit Economic Growth Association (DEGA), and more. The International Academy, an all International Baccalaureate school (a public, tuition-free consortium high school operated by Bloomfield Hills Schools which consistently ranks among the top 10 public high schools in the nation by Newsweek magazine), Cranbrook Schools (an exclusive private boarding school and academy), the Eton Academy, and Henry Ford Academy are some of outstanding secondary schools that are located in the area. Some of the major companies which have headquarters or a significant presence in metro Detroit include GM, Ford, Chrysler/Fiat, Volkswagen of America, Comerica, Rock Financial/Quicken Loans, Kelly Services, Dominos, American Axle, DTE Energy, Compuware, Covansys, Lowe Campbell Ewald, TRW, BorgWarner, ArvinMeritor, United Auto Group, Pulte Homes, Taubman Centers, Guardian Glass, Lear Seating, Masco, McKesson Corporation, Northrup Grumman, General Dynamics Land Systems, Delphi, AT&T, EDS, Microsoft, IBM, Google, Twitter, Verizon, Asterand, PNC Bank, Delta Air Lines, Bank of America, and Raymond James, PwC, Ernst & Young, and more. This is only a small list of shops and even though they are listed here, their info is brief. Make sure to check out the district articles for more. Division Street Boutique  1353 Division St. Suite 1w, Serves as a home base storefront for Aptemal Clothing, famous for creating the "Detroit Hustles Harder" clothing line. Eastern Market  2934 Russell St. Historic Farmers Market. Hours 7 AM - 5 PM. Monday-Saturday. Closed Sundays. John K. King Books  901 W. Lafayette, 313-961-0622 One of the best used bookstores in America with over 500,000 books in stock. Moosejaw  1275 Woodward Ave, 313-938-3605 Michigan based outdoor clothing and equipment retailer. Peoples Records  3161 Woodward Ave, Vinyl record shop in Midtown. Pure Detroit  Detroit Souvenirs. Stores inside the Renaissance Center, the Fisher Building, and the Guardian Building. Riverfront Shops  Detroit. Inside the GM Renaissance Center Winter Garden. Shinola  441 W Canfield, 313-285-2390 Detroit based manufacturer of watches, bicycles, and leather bound goods. Submerge Records  3000 E Grand Blvd, Record shop in New Center specializing in Detroit techno and other electronic music. Detroit does not really have a lot of retail options within the city and as a result most city residents tend to head to the suburbs to do any major shopping. Thankfully this has started to change somewhat with a few local independently owned supermarkets opening up and the opening of a Whole Foods Market in Midtown, two Aldi stores, and two Meijer stores means that Detroit no longer has the dubious distinction of being the largest city in the US without a chain grocery store. The major drug store chains such as CVS and Walgreens in addition to convenience stores such as 7-11 however do have a few locations scattered throughout the city. Detroit is world famous for the coney, a hot dog with chili, mustard, and chopped fresh onions. The most known coney restaurants are the American Coney Island and Lafayette Coney Island, both located next door to each other in downtown Detroit. The two restaurants have had a rivalry since the 1920s. Coney Island style restaurants can be found all over Detroit. Local chains such as National Coney Island and Leo's Coney Island serve suburban areas outside the city limits. Detroit-style pizza is a delicious and crispy deep dish pizza that you can't truly find outside of Michigan. It is not quite as thick as Chicago-style pizza, but the buttery crust is worth seeking out. The Detroit classic is Buddy's Pizza restaurants chain, with numerous locations a half hour drive from the city. In downtown, numerous restaurants serve Detroit-style pizza, including Niki's Pizza. Explore Detroit's Greektown, with its Greek restaurants and shops surrounding the Greektown Casino. Detroit's Mexicantown is known for Mexican cuisine at restaurants such as Mexican Village, Evie's Tamales, El Zocalo and Xochimilco. Restaurants, bakeries, and shops are located on Vernor Highway, on both the east and west sides of the Interstate 75 service drive. Hamtramck is famous for its Polish cuisine and bakeries and neighboring Dearborn is known for it's wide selection of restaurants serving Lebanese and Arabic fare. Choose to dine in elegance at one of Detroit's many fine restaurants a sample of which include the Coach Insignia atop the Renaissance Center Downtown, the Whitney House restaurant in Midtown, or the Opus One in the New Center. Detroit's downtown has an emerging food scene with several new farm to table restaurants. Vernors Ginger Ale, created by Detroit pharmacist James Vernor, shares the distinction as America's oldest soft drink with Hire's Rootbeer. A local favorite, Detroiters pour Vernors over ice cream (this drink is called a "Boston Cooler" in reference to Boston Blvd. in Detroit, not the city in Massachusetts). Also try Faygo soft drinks, another former Detroit based soft drink company. Detroiters enjoy Michigan Wines. A family of GM heritage, the Fisher family Coach Wines are served at the Coach Insignia Restaurant atop the GM Renaissance Center. The Detroit area also hosts a number of microbreweries . Detroit is a huge city, so all individual listings should be moved to the appropriate district articles, and this section should contain a brief overview. Please help to move listings if you are familiar with this city. This is only a small list of hotels and even though they are listed here, their info is brief. Make sure to check out the district articles for more. Detroit Regency Hotel, 1999 East Jefferson Ave, budget hotel with shuttle service downtown. Hostel Detroit, 2700 Vermont St, modern hostel opened in 2011. Holiday Inn Express Hotel & Suites Detroit Downtown, 1020 Washington Boulevard, centrally located budget hotel with free WiFi and breakfast. Fort Shelby Hotel and Conference Center, 525 West Lafayette Blvd, historic hotel with modern amenaties reopened in 2008. The Atheneum Suite Hotel  1000 Brush Avenue, Detroit. +1 313 962-2323. Luxury hotel, stunning Greco-Roman contemporary in the heart of downtown's Greektown, near stadiums, accommodates large conferences. Detroit Marriott at the Renaissance Center  Contemporary luxury hotel, overlooks the spectacular International Riverfront with many restaurants including Coach Insignia rooftop restaurant, shops, and 100,000 sq. ft. of meeting space. This is the tallest hotel in the Western Hemisphere, a world-class facility. This facility connects to the elevated rail system known as the People Mover which encircles the downtown area. Near Cobo Hall Convention Center, cruise ship dock, stadiums, Greektown, casinos, museums, Windsor, and area attractions. Guests have included Ronald Reagan. Westin Book-Cadillac Hotel  1114 Washington Blvd., Detroit. The city's historic flagship luxury hotel, European elegance, downtown location, world-class facility with attached parking garage. Guests have included Presidents Herbert Hoover, Franklin D. Roosevelt, Harry S. Truman, Dwight D. Eisenhower, John F. Kennedy, and many celebrities. Detroit has two daily newspapers, the Detroit Free Press and the Detroit News. Both newspapers are available throughout the city. The free weekly MetroTimes covers news, arts and entertainment. The Detroit News, . Published Monday through Saturday. Detroit Free Press, . Published daily. Metro Times, . Alternative weekly published Wednesdays. Despite an improving crime rate in recent years, Detroit remains the most dangerous major city in the United States. Many neighborhoods within the Detroit city limits, including some relatively close to the downtown core, have high crime rates and should be avoided. Many areas in the city also suffer from extensive urban decay. When travelling through Detroit, sticking to major roads and freeways is key to avoiding unnecessary problems. Carjacking, while uncommon, can occur in dangerous and isolated neighborhoods. Also noteworthy are the aggressive, sometimes violent confrontations that can occur after car accidents, especially involving pedestrians. However, despite these obvious problems, most tourist attractions are in the safe downtown and midtown neighborhoods. In fact, the overall crime rate in the downtown area is below the national average, and crime has largely declined in the revitalized area in the last twenty years. But, even with the declining crime rate, one should be aware opportunistic crimes can and do occur in downtown and midtown, and some precautions should be taken when out after dark, including staying in groups and not carrying large amounts of money. Typically, how you carry yourself can easily keep you from getting mugged. Unfortunately for the arts and music lover, much of the current scene is scattered between downtown venues like the Majestic Theater/Magic Stick complex, places in Hamtramck, and suburban venues in places like Royal Oak. Some venues, such as Harpo's on the east side, are in dangerous neighborhoods. Others attractions, including Fort Wayne and The Heidelberg Project, are also in unsafe areas. Sporting events, festivals and other large public events are always heavily policed and typically safe. Sporadic crime events, mostly alcohol-related and involving groups of youths, have been reported at some of these events but they are by far the exception. Unlike the inner city, suburban Detroit is remarkably safe and has several sights worth seeing. The Detroit Zoo, Greenfield Village, and The Henry Ford Museum are all in low crime neighborhoods. Unsafe suburban areas are typically far away from any tourist attractions and have little to no interest for the typical traveler. Driving on major roads and freeways in Detroit can be a stressful task. Motorists typically drive 10-20mph above the legal speed limit, which is 25 or 30mph on urban collectors/major roads and 55-70 mph on freeways. Traffic signals are often ignored, especially at night and in poor neighborhoods outside the downtown area. It is advisable to avoid driving in Detroit if you are a new and inexperienced driver or feel hazardous while going at very high speeds. Road accidents are a common experience, some which are fatal. Emergency services are quick at responding to accidents on Interstate highways and freeways, but long waits and delays can occur in some neighborhoods of Detroit due to limited resources and poor funding. If you find yourself a victim or witness of a crime, be sure to contact the Detroit Police Department at (313) 267-4600 as soon as it is safe to do so, or dial 911 if in an emergency. If your passport or personal identification are stolen, this should be reported immediately to the Detroit Police Department and your federal government to prevent identity fraud. Assault victims with injuries should go to an emergency room to have said injuries documented, even if they are minor in nature. Victims of crime who are not American citizens should also contact their country's embassy and report details of the event. Although Detroit itself provides the majority of the region's visitor attractions, the entire Southeast Michigan area is large and diverse and contains a great wealth of hot spots and attractions that are also well worth visiting. Ann Arbor - Home to the University of Michigan , Ann Arbor offers many attractions of a self-enclosed small city. A thriving downtown, lots of culture, and plenty of students. Cannabis possession in this city outside of University of Michigan property is only a 25 dollar fine, making this one of the most liberal cities in Michigan. Canoeing is a favorite pastime on the Huron River, available through Metro parks  near Ann Arbor. Additionally, the city boasts the number one rated Ann Arbor Street Art Fair  which attracts over 500,000 attendees from across the nation each July. Enjoy the Beach at Kensington Metropark, or winter skiing at nearby Mt. Holly, and Brighton. Dearborn - Detroit's suburb to the Southwest and home of Ford Motor Company, Dearborn, has a leading attraction, The Henry Ford (the Henry Ford Museum & Greenfield Village)  a large historical and entertainment complex, and the Automotive Hall of Fame. Dearborn has the second largest Middle-Eastern population in the World, with mosques being a common sight and a wide selection of Middle-Eastern food and shopping. Detroit's public information campaign, "The World is Coming, Get in the Game" has created an online tour (see section "Do" for the link) of Dearborn's cultural scene. Flint - The home of the modern labor union movement in the U.S. While not as tourist-friendly as Ann Arbor, Flint has a great art scene for a city of its size and is much less pretentious. Grand Rapids - Michigan's second largest city. With a skyline filled with construction cranes, many believe Grand Rapids is Michigan's future. With a great, clean downtown area and the city's proximity to Lake Michigan, Grand Rapids is a grand experience waiting to happen. Lake St. Clair and the St. Clair River - Waterfront activities and living are among the luxuries of the metropolitan Detroit area. Experience cruises and boating on beautiful Lake St. Clair. The St. Clair River connects Lake St. Clair to Lake Huron. In the quiet town of St. Clair, along the St. Clair River, dine at the Voyager Seafood restaurant at 525 South Riverside. Enjoy the charm of a small town lifestyle in a major metropolitan area in and around Lake St. Clair's Anchor Bay . Visitors to downtown Detroit may reserve a dock at Tri-Centennial State Park and Harbor . Or enjoy a Great Lakes cruise . Royal Oak - Home to the beautifully landscaped Detroit Zoo, Royal Oak is a gay friendly suburb outside of Detroit which boasts a classy night scene with exciting dining and a diverse avant-garde bar culture. Troy - Troy, a suburb of Detroit, contains the Somerset Collection, one of the largest upscale malls in the Midwest. Visit Nordstom, Macy's, Henri Bendel, Ralph Lauren/Polo, Neiman Marcus, Saks Fifth Avenue, Tiffany & Co, Barney's New York, and more than 180 other specialty shops. Follow Big Beaver Road east as it becomes the Metropolitan Parkway toward Metropolitan Beach on beautiful Lake St. Clair. Toledo, Ohio is about an hour south on the DT Expressway (I-75). This mid-sized city is on the edge of Lake Erie, which offers numerous nearby recreational opportunities. The city is a good destination for restaurant and architecture buffs. Toledo also boasts a nationally known art museum and zoo, and is a regional center for alternative energy research and development. Cedar Point located in Sandusky, OH is about an hour east of Toledo, this action packed amusement park is routinely ranked among the best in the world. Windsor, Ontario, Canada lies just across the Ambassador Bridge or through the Detroit-Windsor Tunnel, which is located right next to the Renaissance Center (good to use if you see traffic backed up onto I-75). This heavily trafficked border crossing has shaped Windsor more than anything else; well-maintained, walkable streets, shops and restaurants, Caesars Windsor casino, and adult entertainment. The lower drinking age (19) draws young Americans and ensures a vibrant club scene on weekends. Windsor provides great views of Detroit's skyline, especially on summer nights from waterfront Dieppe Park. Crossing the border requires a passport, enhanced driver's license, or a trusted traveler card. This page was last edited on 28 March 2019, at 19:17.